در بخش باختری پهنه گسلی میامی به عنوان مرز دو پهنه ساختاری ایران مرکزی و بینالود، به‌ دلیل اینکه تغییرات راستای گسل میامی بیشتر در زیر پوشش آبرفتی و یا بلوک‌های جابه‌جا شده سنگی پنهان مانده است، مشاهدات طبیعی جزیی و محدود به‌ تنهایی پاسخگوی ابهاماتی چون تاریخچه‌ دگرریختی و تکوین پهنه نیست. در این پژوهش برای آسانی دسترسی به‌ واقعیت زمین‌‌ساختی موجود، مدل‌سازی تجربی در قالب 5 نوع آزمایش با ترکیبی از تنش‌های برشی راست‌گرد و چپ‌گرد با فشارشی در شرایط تغییر زاویه مرزهای گسلی پهنه مورد مطالعه انجام شد. بر پایه نتایج این پژوهش، شواهد حاصل از آزمایش با سازوکار اعمال تنش از نوع امتدادلغز راست‌گرد با مؤلفه‌ فشارشی همانندی زیادی با شواهد صحرایی بخش باختری پهنه گسلی میامی از جمله چین‌ها، برش‌های ریدل، هندسه و خم‌های گسلی و موقعیت دوپلکس‌های گسلی دارد. جنبش ایجاد شده با سازوکار برش ناهم‌محور راست‌گرد با مؤلفه فشارشی، توزیع دگرریختی منطقه را بر عهده دارد. این مدل آزمایشگاهی، بینش مناسبی از نوع و تاریخچه دگرریختی را فراهم کرده است؛ به‌طوری که بر پایه آن می‌توان ادعا کرد که بخش باختری گسل میامی در اثر برش ناهم‌محور راست‌گرد با مؤلفه فشارشی دگرریخت شده و چرخش حاصل از این برش، روند ساختارها را در زمان‌های مختلف تغییر داده است. In the western part of Miami fault zone (MFZ) as a partial boundary of two main structural zones (Centeral Iran and Binaloud) in the Iranian plateau, since the fault is covered by alluviums or displaced rocks, poor and limited field data cannot solve the problems concerning deformation history and evolutionary path of the MFZ. To facilitate unraveling the structural problem, we tried to conduct five experimental models using a combination of compressional, dextral and sinistral mechanisms with changes in the geometry of two main boundary faults. Based on the results, evidences from transpression with dominant dextral component are very similar to field observations along the western MFZ, including folds, Riedel shears, duplexes, fault geometry and bends. Based on the model, deformation in the western part of MFZ is accommodated by dextral non-coaxial shear with compressional component. The experimental model provided a proper insight about deformation history and style. It is proposed that the western part of the MFZ has been deformed by dextral non-coaxial shear with compressional component, and some resultant rotations have probably changed structural trends during time. آقانباتی، س. ع.، ۱۳۸۳- زمین‌شناسی ایران، سازمان زمین‌شناسی و اکتشافات معدنی کشور، 606 ص. 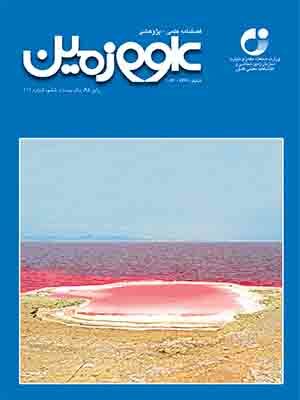 باقری، ف.، سعیدی، ع. و بوذری، س.، 1386- تحلیل هندسی و جنبشی نیمه باختری گسل میامی ، علوم زمین، شماره 69، صص. 34 تا 43. درویش­زاده، ع.، 1388- زمین­شناسی ایران: چینه­شناسی، تکتونیک، دگرگونی و ماگماتیسم. انتشارات امیرکبیر. رستمیان، م. و خادمی، م.، 1393- تحلیل دگرریختی و کرنش پهنه­ گسلی میامی در منطقه میامی، البرز شرقی، پایان­نامه کارشناسی ارشد تکتونیک، دانشگاه دامغان، 132 ص. میربیگی، ن.، 1392- ارزیابی فعالیت تکتونیکی ناحیه میامی بر اساس شاخص گرادیان طولی رودخانه، انتگرال و منحنی هیپسومتری، زنجان: وزارت صنعت و معدن تجارت سازمان زمین‌شناسی و اکتشافات معدنی کشور (سی و دومین گردهمایی و نخستین کنگره بین المللی تخصصی علوم زمین). نبوی، م. ح.، 1355- دیباچه‌ای بر زمین‌شناسی ایران، سازمان زمین‌شناسی کشور. Alavi, M., 1996- Tectonostratigraphic Synthesis and Structural Style of the Alborz Mountain System in Northern Iran, Journal of Geodynamics, Vol. 21, No. 1, pp. 1-33. Bartlett, W. L., Friedman, M. and Logan, J. M., 1981- Experimental folding and faulting of rocks under confining pressure. Part IX. Wrench faults in limestone layers. Tectonics 79: 255-277. Braun, J., 1994- Tree-dimensional numerical simulations of crustal-scale wrenching using a non-linear failure criterion, Journal of Structural Geology, Vol. 16 (8): 1173-1186. Christie- Blick, N. and K. T. Biddle., 1985- Deformation and basin formation along strike-slip faults, in strike-slip Deformation, Basine Formation, and sedimentation, edited by K. T. Biddle and N. Christie-Blick, pp. 1-34, soc.Of Econ.paleontol. And Mineral., Tulsa, Okla, 1985. Dooley, T. and McClay, K., 1997- Analog modeling of pull-apart basins: AAPG Bull. V. 81: 1804-1826. Fossen, H., 2010- Structural Geology, in the uited states of America by cambridye New york university press. Fossen, H., Tikoff, T. B. and Teyssier, C. T., 1994- Strain modeling of transpressional and transtensional deformation. NorskGeologisk 74: 134-145. Morgenstern, N. R. and Tchalenko, J. S., 1967- Microscopic structures in kaolin subjected to direct shear. Geotechnique 17: 309-328. Naylor, M. A., Mandl, G. and Sijpesteijn, C. H. K., 1986- Fault geometries in basement-induced wrench faulting under different initial stress states. Journal of Structural Geology 8: 737–752. Richard, P. and Cobbold, P., 1990- Experimental insights into partitioning fault motions in continental convergent wrench zones. AnnalesTectonicae 4: 35–44. Riedel, W., 1929- ZurMechanikGeologischerBrucherscheinungen. Z. Mineral. Geol. Palaeontol. Vol. 1929B, pp. 354-368. Sylvester, A. G., 1988- Strike-slip faults, Geol. Soc. Am. Bull., l00: 1966-1703. Tchalenko, J. S. and Ambrayses, N. N., 1970- Structural analysis of the Dasht-e-Bayaz (Iran) earthquake fractures. Bull. Geol. Soc. Am. 81: 41-60. Tchalenko, J. S., 1970- Similarities between shear zones of different magnitudes. Bull. Geol. Soc. Am. 81: 1625-1640. Viola, G., Odonne, F. and Mancktelow, N. S., 2004- Analogue modeling of reverse fault reactivation in strike-slip and transpressive regimes: application to the Giudicarie fault system, Italian Eastern Alps, Journal of structural Geology 36: 401-418. Wilcox, R. E., Harding, T. P. and Seely, D. R., 1973- Basic wrench tectonics.Association of Petroleum Geologists Bulletin 57 (1): 74±96. Withjack, M. O. and Jamisom, W. R., 1986- Deformation produced by oblique rifting. Tectonophysics. 126: 99-124.